For the past five years, I’ve had a regular housesitting gig over the Australia Day long weekend, where I decamp from my apartment in the city and take up residence in a somewhat larger dwelling in the eastern suburbs of Melbourne. It’s my very own version of ‘Escape to the Country’ if you will, where I can get away from the familiar and discover what it is like to live in another part of my city. So it felt kind of apt to kick-off the long weekend with a leisurely brunch at Town & Country in Balwyn. Sitting in the open front courtyard with the morning light filtering through the canopy overhead, I could have certainly been anywhere else in the world instead of having breakfast alongside a busy metropolitan road. With a welcome cool breeze on my face, and my coffee order on the way, I got down to the difficult task of deciding what to order for breakfast. The current seasonal menu is heavily geared towards savoury options, but any dish that includes ‘Dr Marty’s crumpets’ usually seals the deal for me. Albeit a slightly edgier take on Eggs Florentine, two substantial stacks laden with chargrilled asparagus, baby spinach, thick slices of smoked salmon, poached eggs topped with a careful consideration of hollandaise sauce, complimented with a large sprig of fresh and deliciously pungent dill, was a visually spectacular ensemble. And the taste didn’t disappoint either. The asparagus was a notable addition – it was so soft and tasty from the length of time on the grill that it only took a fork to pull it apart. However the real hero of the dish would be the thick, doughy crumpets that absorbed all the moisture from the spinach, poached eggs and thick sauce and yet still held their shape and bread-like taste. My faith in Dr Marty’s creations continues to be justified. The coffee is also full-bodied and delicious. Service is friendly and very attentive although it would be fair to say that the staff are quite busy, so patience is required. Apart from the cafe, Town & Country also includes a nursery and homewares store, fully stocked with designer soft furnishings and unique decorator items, so make sure you exit through the gift shop. And why not? It’s a public holiday afterall. I like to try and take a cooking class whenever I travel, endeavouring to learn and understand more about the cuisine of the country that I’m visiting. But I must admit that after holidaying around Europe and eating at numerous restaurants for breakfast, lunch and dinner over the past eight weeks, I’m not entirely sure if I can remember how to cook. So with an equal sense of trepidation and excitement, I arrived at the Diavlos Tavern in the heart of Athens, eager to escape the late-afternoon thunderstorm and ready for my three-hour cooking lesson in Greek cuisine. After meeting cooking instructor Fofi Olympidou outside the restaurant, our group of seven participants who were all coincidently international travellers like myself, went upstairs into a private room where the table had been laid with our individual workstations and aprons. I must admit that this is only the second cooking class that I’ve undertaken where you are seated for the entire session and my relaxed holiday vibe loved it! Fofi started the session with an introduction to Greek cuisine and challenged us as to what our own understanding of traditional Greek fare was. For as long as I can remember I had somehow associated baklava with Greek food, probably because I see it served in Greek pastry shops and Greek restaurants back home in Melbourne. Fofi corrected that perception by commenting that baklava was actually a legacy from the Ottoman Empire, which has been assimilated into Greek cuisine, but is not considered to be traditionally Greek. The traditional Greek menu for the evening was to be zucchini balls, tzatziki, dolmades, Greek salad, spanakopita, roast lamb with potatoes followed by a Greek yoghurt dessert. I’ve never prepared any of these dishes at home so I was really looking forward to participating in the end-to-end cooking process, all the way from the beginning to eating and enjoying the final result. As per Greek tradition, we started with an aperitif of raki made from grapes, complemented with mezze, which is a term used to describe small serves of food to accompany drink. It was rather nice to begin the evening with something other than ouzo as aniseed is not my favourite flavour and I’ve been served quite a few glasses of this aperitif during my time in Greece. The raki was quite smooth to drink but with a powerful finish that you typically get from beverages with 45 per cent alcohol volume. I took note of Fofi’s advice to take small sips and enjoy with the mezze of bread, feta cheese, tomatoes and olives served on the table. The dish taking the longest time to cook was the roast lamb with potatoes, which needed to be baked in the oven for approximately an hour and a half, so this naturally was the first recipe to be prepared for the evening. Fofi explained that sheep and goats are quite prevalent in the mountainous areas of Greece, therefore lamb is a meat that features predominantly in Greek cuisine. With one portion of lamb given to each one of us, we carefully followed Fofi’s verbal instructions by making several cuts into the meat and then filling each hole with a sliver of garlic, pinches of dried oregano, salt and pepper before placing back into the baking tray. Take careful note of the container of olive oil in the photos above which is almost full at this point in the evening. Rather than getting up and washing our boards and utensils in the kitchen, there were bottles of vinegar and paper towel on the table that we could use to wipe down our individual preparation areas and knives, before starting to peel and cut potatoes into small portions for the next part of the dish. Topped with a dressing made from lemon juice and mustard, Fofi generously added more salt, pepper and oregano to the baking tray before liberally applying olive oil over the lamb with a little water and then covering in preparation for roasting. With the lamb whisked away to be cooked in the oven, the next part of the lesson was to start the spanakopita which is a classic Greek dish not dissimilar to a cheese and spinach pie. Most of us are typically accustomed to buying and using ready-made sheets of filo pastry to make spanakopita at home, but Fofi assured us that it was relatively quick and easy to make our own pastry for this recipe. Combining a simple mixture of flour, water and olive oil together in a large bowl, the dough began to take form and surprisingly a KitchenAid or Thermomix was not required other than some old-fashioned elbow grease. Most of us were given a small ball of dough to roll and then flatten into a circular shape that would be used to cover the base of the pie dish, which I must admit wasn’t an easy feat to achieve sitting down. The next step was to start to chopping the herbs and vegetables for the filling and then spread over the pastry base before covering with the two remaining discs of pastry that had been set aside. One of the key ingredients of spanakopita is feta cheese which is traditionally made from either sheep or goats milk. Rather than cutting the cheese in preparation for the filling, Fofi gave some excellent advice on how the cheese should be grated instead so as to control the residual liquid content, in addition to some great tips for removing the excessive salty flavour typically found in purchased feta cheese. Fofi demonstrated everything so beautifully, including cutting the top pastry layer into equal portions neatly without breaking through into the filling beneath. With a quick milk wash before being placed in the oven, another dish had been completed and all in the space of 15 minutes. Many hands make light work but I’m pretty positive it would take me five times as long to achieve a similar result in my own kitchen, but definitely worth a try at home. The next dish to be prepared on the evening menu was the ever popular dolmades which I enjoy eating but have never made from scratch. Dolmades, or stuffed grape vine leaves, can be made with meat and rice, however the traditional version we were making had a rice and herb filling. Fofi first demonstrated how to lay the leaf on the board followed by the wrapping process before letting us reciprocate. My first dolma wasn’t too bad considering but the quality improved markedly with each new attempt. Once the saucepan had been filled with our own contributing efforts, Fofi added water and a few glugs of the obligatory olive oil to the dish before sending it downstairs to the kitchen to cook during the remainder of our lesson. While there is a lot of meat in Greek cuisine, Fofi explained that stuffed vegetable dishes and the use of vegetables as an accompaniment to each meal, are also key to traditional Greek cooking. The next dish of zucchini balls is a popular inclusion on mezze platters and entrée courses and relatively simple to prepare. Apart from grating a few zucchinis and chopping spring onions, it was a matter of adding eggs, flour, herbs and cheese to create a dough-type mixture. The hard part of rolling the individual balls and deep-frying in olive oil (of course!) was best left to the kitchen staff down below! The perfect accompaniment to crispy zucchini balls is naturally tzatziki, which is a mixture of thick Greek yoghurt, shredded cucumber and garlic. Because of its cool, creamy texture tzatziki is often paired with rich meat dishes or fried foods for added flavour and to assist with digestion, however it is also commonly served as a dip. The most identifiable ingredient in tzatziki tends to be the presence of finely minced, raw garlic and so for the quantity we were preparing to be served with our evening meal, everyone at the table was each given a glove of garlic to peel and chop for the bowl. When all the ingredients had been included, Fofi poured a very healthy amount of olive oil into the bowl before combining everything together into a smooth consistency. As if by magic, the first batch of zucchini balls arrived at our table, in time for us to try with the just finished bowl of tzatziki. While we were busy devouring the zucchini balls and tzatziki with a glass of Greek white wine, Fofi started to prepare and cut the ingredients for horiatiki, or what we commonly refer to as a traditional Greek salad. This dish is essentially a meal in itself, consisting of tomatoes, cucumber, Kalamata olives, sliced red onion and capsicum (bell pepper), topped with feta cheese, dried oregano and olive oil, although variations of this salad will occasionally include capers. Fofi explained that horiatiki served in restaurants should have a large slice of feta cheese on the top, as a way of demonstrating to the patrons that the cheese served in the salad has been freshly cut from the block and has not been recycled from a previous dish. Good to know! Olives and olive oil are essentially the heart and soul of Greek cuisine. Olives are generally served at every single meal in Greece, even breakfast! Greece is the third largest producer of quality olive oil after Spain and Italy but is largest consumer of olive oil in the world. This fact has been well and truly demonstrated throughout the entire evening, as the olive oil container is now empty with Fofi continuing to generously pour any remaining liquid over the salad as a dressing. And so now we had arrived at the final dish to be prepared for the evening, a Greek yoghurt dessert. According to Fofi, a good quality Greek yoghurt must have at least 10 per cent fat content – if it doesn’t, its not Greek yoghurt! Greek yoghurt is considered to be good for the digestion, particularly after consuming rich meat or fried foods, therefore it tends to be served with fresh or preserved fruit (which is also referred to as spoon sweets in Greece) for dessert. This dessert is also a simple dish to prepare – strained Greek yoghurt, a can of sweetened condensed milk, grated rind and juice from a lemon, all combined together with a whisk. 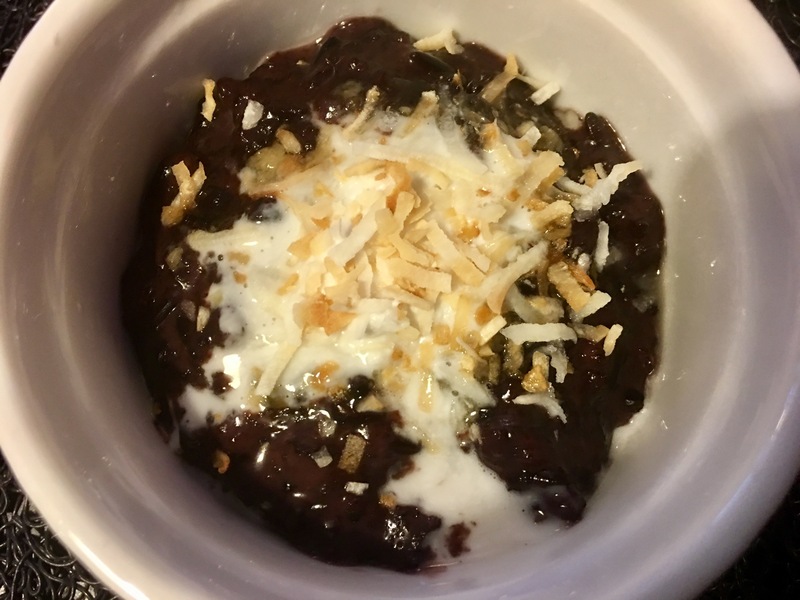 I don’t think I’ve ever made such an easier or tastier dessert in less than 10 minutes. 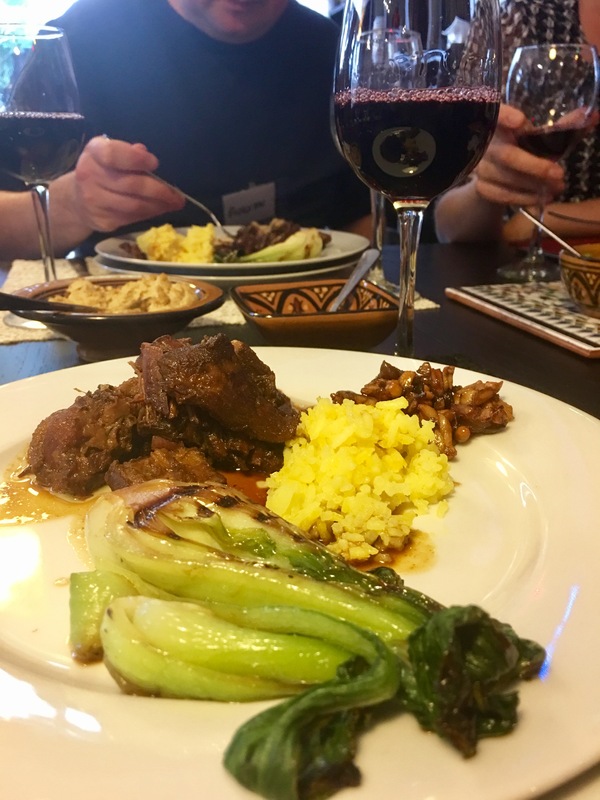 It’s hard to believe that three hours have already flown by and while the class was fun and informative, the real action begins as we head downstairs into the restaurant terrace to consume all the dishes that we had helped prepare. Our banquet-style dinner started with the freshly made horiatiki, followed by the zucchini balls and tzatziki dip, and the dolmades. The new batch of zucchini balls were more crispier than our first sample, no doubt from having benefited from a longer stint in the deep-fryer, matched nicely with the sharp and creamy tang of the tzatziki. Fresh out of the pan, the warm dolmades were glistening in the candlelight, with a sleek sheen from its prolonged olive oil bath. The texture of the cooked rice combined with the moist grape leaves and the soft, subtle flavour of dill was absolutely delicious and I started to question whether I would ever consider purchasing dolmades again. The same could also be said for the next course of spanakopita, with the crispy, thicker-style pastry that we had helped to prepare. The crunchy and crisp texture of the pie pastry was definitely more flavourful than its commercial counterparts and almost a complete meal in itself. Then the main course of roast lamb and potatoes that I had been eagerly anticipating arrived at the table. The slow-cooked meat and soft, lemon and herb-flavoured potatoes was definitely a highlight but it was certainly a struggle to consume my allocated portion of lamb following all the previous courses. And by way of demonstration that Greek yoghurt is the answer to all digestive ailments, the chilled sweet yoghurt dessert was served at the conclusion of the evening. I can’t remember attending such an informative cooking class and preparing a range of delicious recipes with a simple list of ingredients and relatively easy cooking processes. With everything demonstrated and explained so effectively, I’m looking forward to going home again and preparing my own traditional Greek dinner for my friends and family. I love Greek food. One of my fondest childhood memories is smashing plates on the floor at Albury’s only Greek restaurant with my family. And while that restaurant’s existence was unfortunately unable to rival that of the Parthenon, my love for Greek cuisine continues to endure. A is for Anise which is the predominant flavour found in the traditional Greek aperitif of ouzo. Whilst my palate is still yet to appreciate the distinctive taste of anise, in many of the restaurants that I visited during my holiday, legendary Greek hospitality ensured that a shot of ouzo was placed in front of me before I started my meal. It feels somewhat appropriate to begin with an aperitif before I eat my way around Greece. Opa! B is for Bougatsa. (You probably thought that I would say baklava and yes, I definitely ate plenty of that as well, but I’ve been reliably informed that baklava is not traditionally Greek but rather a legacy from the Ottoman Empire). Bougatsa is a pastry that can be either sweet or savoury, consisting of warm semolina custard or soft creamy cheese between layers of filo pastry. If I was down to my last Euro, I would probably buy a tray full of this … or a glass of wine. It’s a tough call. Let’s just say that my heart would skip a beat whenever I saw this at the breakfast buffet. C is for Cheese. Whilst there are many varieties and differing textures of cheese found in Greek cuisine (Feta, Haloumi, Graviera, etc.) 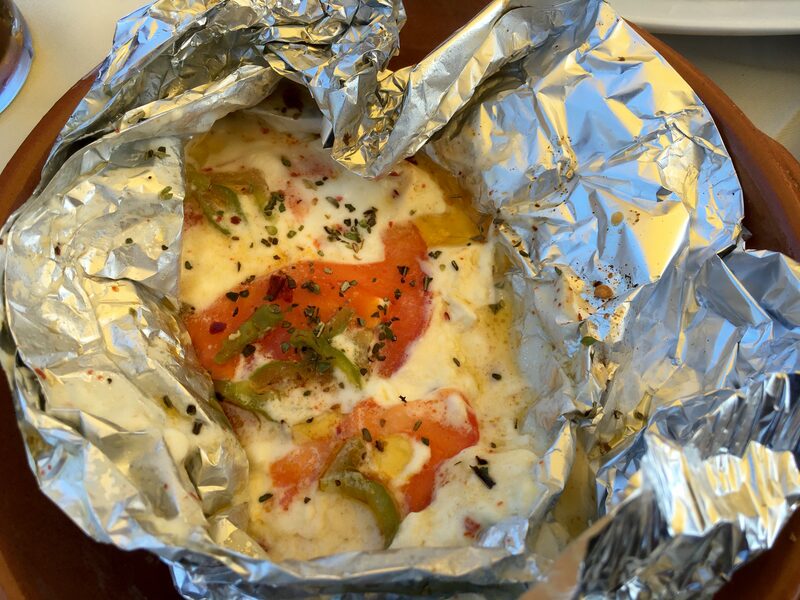 my favourite cheese dish would undoubtedly be saganaki. Traditionally served as an appetiser, this dish derives its name from the small frying pan in which Kefalograviera cheese is quickly cooked over a high heat and served with fresh lemon. Have your knives at the ready so you can successfully fight off your friends for a portion while it’s still hot. D is for Dolmades. 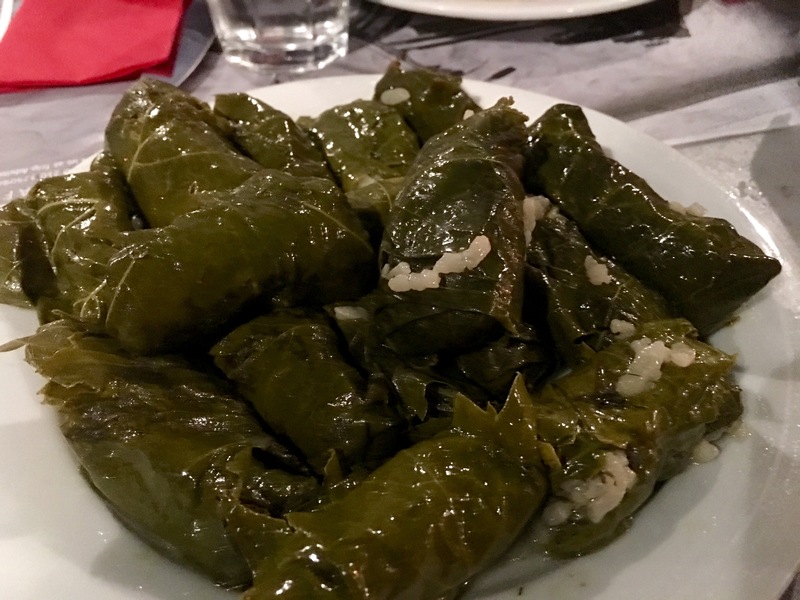 Served hot or cold, dolmades are grape leaves stuffed with rice and fresh herbs (usually dill, which is my favourite herb) although they can also be filled with minced meat and rice. Deceptively small, dolmades are almost a meal in themselves and are always a hit when they appear on a mezze platter. E is for Eggplant which is the main ingredient in one of my favourite Greek dishes, moussaka. Moussaka is a layered pie made with sliced fried potatoes and eggplant, tomato-based sauce, spiced minced meat topped with béchamel and cheese. The more memorable versions of moussaka that I enjoyed had identifiable hints of cinnamon and nutmeg in the meat filling. But not even the best Greek chefs can compete with my sister Nicole’s version because hers is always made with love. F is for Fava. 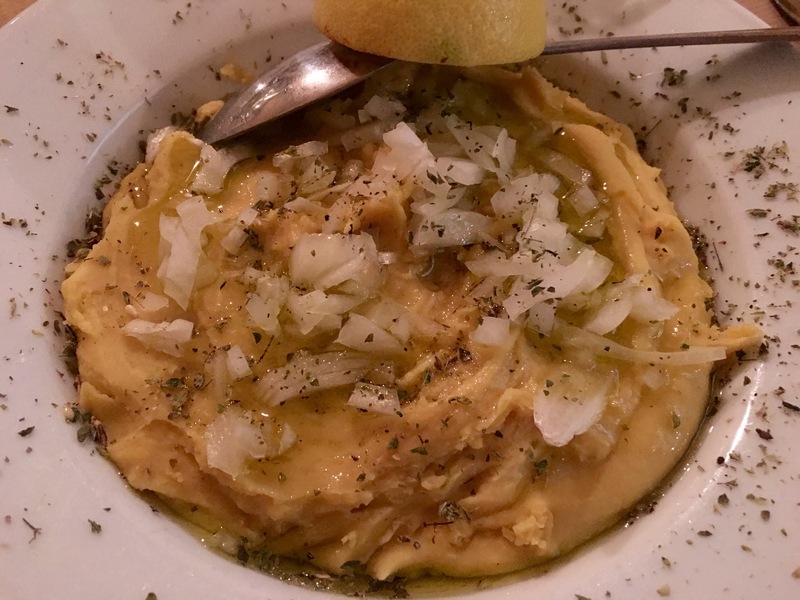 Fava originates from the island of Santorini and is a warm purée of cooked yellow split peas topped with finely chopped red onion. It can be served as an appetiser, mezze or accompaniment to the main meal and is really quite tasty. Although be aware that it is made with a healthy dose of garlic, so in conjunction with the fresh onion topping, you are guaranteed to repel any vampires and gypsies in your immediate vicinity for at least 48 hours. G is for Gyros. Pronounced with a “Y”, the word “Gyro” means “turn” in Greek referring to the meat cooked on a vertical rotisserie (generally pork or chicken) which is then carved from the spit and served wrapped in pita together with cucumber, tomato, onion, tzatziki and chips inside. Gyros are the ultimate Greek version of fast food and I found a couple of great places selling these in Athens for only 2-3 Euros a piece. H is for Horiatki or what you and I commonly know as a traditional Greek salad. This is essentially a meal in itself, consisting of tomatoes, cucumber, Kalamata olives, sliced onion and capsicum, topped with feta cheese, dried oregano and olive oil. Sometimes variations of this salad will also include capers. I recently learnt that Greek salad served in restaurants should have a large slice of feta cheese on top in order to show the patrons that the cheese used in the salad is freshly cut from the block and not recycled from another dish! I is for Ithaka, which is a poem written by the Greek poet, Constantine P. Cavafy. While you can’t physically eat the Ithaka, if you read this poem and digest the words you will find your soul nourished and your perspective renewed, particularly if you are still travelling. I had the privilege to hear the Ithaka at the National Archaeological Museum in Athens, beautifully narrated in English by Sean Connery and accompanied to music by Greek composer Vangelis. It was especially poignant being in the final days of my holiday and feeling somewhat fatigued, listening to the Ithaka revived me again. J is for … The letter “J” in the Greek language doesn’t actually exist as it originates from the Latin or English alphabets. It has a few different sound variations when incorporated into the Greek alphabet but many Europeans pronounce “J” as “Y”. Therefore my “J” equivalent is “Yamas!” which is an abbreviation for the Greek phrase “To your health!” or “Cheers!” which I ended up saying quite often on this trip. Yamas! K is for Kebabs which is a general term describing skewered food such as souvlaki, a popular Greek fast food consisting of grilled small pieces of meat such as chicken or pork (or vegetables). It can also be served on a full plate with chips or fried potatoes and pita. 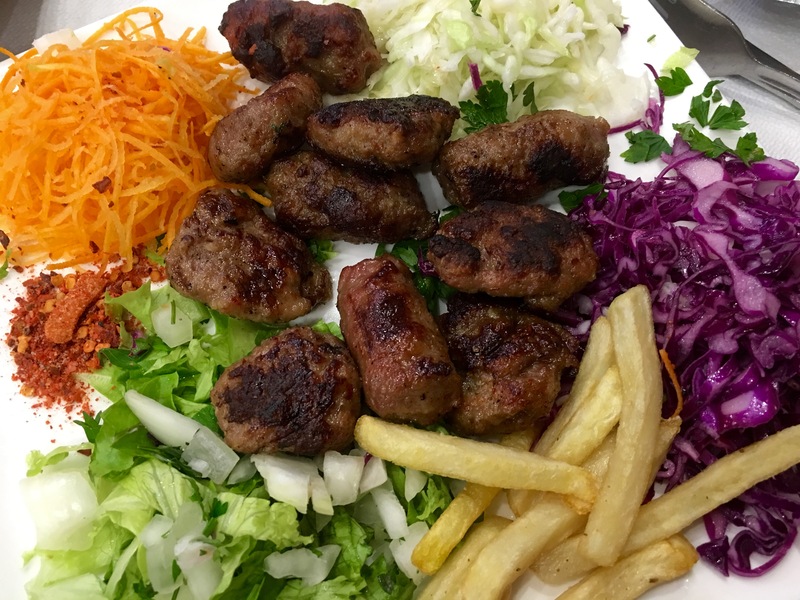 One of exciting things about ordering souvlaki is that no two dishes are ever the same! L is for Lamb. One of my favourite movie quotes comes from My Big Fat Greek Wedding – “What do you mean he don’t eat meat? That’s okay. I make lamb”. While there are many variations on how lamb is cooked in Greek cuisine, I found it very hard to pass by the oven-baked lamb (kleftiko) with potatoes whenever I saw it on the menu. M is for Mezze or a Mixed Grill platter. Why settle for just one dish when you can try new things and enjoy smaller samples of all your favourites? Better still, food always tastes better when shared and enjoyed with friends. N is for Nutella … or is it? The Greeks have their own version of chocolate hazelnut spread called Merenda and many of the hotels in Greece have large bowls of this available on the breakfast buffet. My friend Julie was accustomed to mixing spoonfuls of hazelnut spread into her yoghurt each morning while I just ate a spoonful of it every now and again because it’s awesome. O is for Octopus. The Hellenic Republic, which is another name for Greece, is surrounded by four different bodies of water (the Aegean, Ionian, Cretan and Mediterranean seas) so it’s little wonder that fish and seafood play a prominent role in Greek cuisine. Octopus is usually served grilled or marinated and features as part of a mezze or main meal. Squid (or calamari) is also a favourite often arriving on your plate battered and fried, but there is also plenty of fresh fish, mussels and shrimp readily available at most restaurants. It’s not unusual to see a multitude of sardines and anchovies as well as whole bream, snapper and mullet trying to avoid eye contact as you pass by the display case. Damn it … I got caught! P is for Pita. There is something unique and special about Greek pita – a little smaller and softer in texture than its foreign counterparts – it tastes more like bread and is usually my downfall when brought out to the table, especially accompanied by eggplant dip or an olive tapenade. Some Greek restaurants in Australia also lightly fry the pita in a pan with olive oil before serving … extremely dangerous for the waistline. Q is for … actually there is no such letter in the Greek alphabet! There are 24 letters in the Greek alphabet as opposed to the 26 letters in the English alphabet. A big thank-you to my friend Kiri for being my online Wiki expert for all things Greek! R is for Rizogalo or rice pudding. When I first saw small bowls of this at the breakfast buffet, I thought “Seriously?” and avoided it like the plague. Then one particular morning I decided to try some and didn’t look back. Commonly sprinkled with cinnamon, the version I bought at a local bakery in Athens tasted like a cross between a warm baked custard and cream brûlée. Yummy! S is for Spanakopita. My Mum makes spanakopita regularly at home in Australia, which essentially is a savoury pastry or pie, very similar to a borek, with spinach and feta cheese filling. The handmade filo pastry often used in Greece is a little thicker than the commercial version bought from my local supermarket back home in Melbourne, but no matter where you eat spanakopita, it’s delicious especially when eaten with a salad. T is for Tzatziki which is a mixture of yoghurt, shredded cucumber and garlic that often accompanies grilled meat dishes or is served by itself as a dip. It’s cool, creamy with a bit of a tangy, sharp finish from the added vinegar or lemon juice but like most things, a little bit goes a long way. U is for Ubiquitous and what could be more prevalent in Greek cuisine than olives and olive oil. Travelling around Greece, you will see olives on the breakfast buffet; olives and olive oil in your salad; olive groves as far as the eye can see; your food swimming in a sea of olive oil; souvenirs made from every conceivable part of an olive tree; olive motifs on every menu, napkin and tablecloth in addition to the cans of olive oil and vacuum-sealed bags of olives in gift shops just begging to be taken home. Greece is the third largest producer of quality olive oil after Spain and Italy but is the largest consumer of olive oil in the world. So embrace your inner Greek and immerse yourself in the olive universe! V is for Vegetables. Don’t be fooled by the plethora of meat and seafood dishes in Greek cuisine as there are a number of excellent vegetable dishes on every menu. Tomatoes and capsicum (peppers) stuffed with rice is known as Yemista and is not only delicious but also filling. Another one of my favourites is stuffed cabbage rolls which is called Lahanodolmades, although it does contain minced meat so not strictly vegetarian. Typically there is also okra, zucchini, eggplant, tomatoes and potatoes served as a side to every meal. W is for Wine (not Windex!). Greece is known for producing some excellent wines and the house wines served in most tavernas and restaurants is not only drinkable but also extremely cheap. Wandering around Athens over the weekend, I happened to discover some very chic and beautifully designed wine bars hidden in the backstreets near my hotel, serving amazing wines by the glass. Make sure you try assyrtiko which is a white grape varietal indigenous to the island of Santorini. The 2011 Karipidis Syrah from the Thessaly region was also a standout favourite of mine. Yamas! X is for Xynotyri. Erin, our tour director, ordered this for us to try in a lovely little taverna on the island of Rhodes. Xynotyri, which literally means “sour cheese” is an unpasteurised whey cheese made from sheep or goat’s milk. The fresh goat’s milk cheese which we enjoyed had a creamy, thick yoghurt consistency and was used as a spread although as this cheese matures, it becomes hard and flaky but supposedly has great health benefits. Y is for Yoghurt. All thoughts of going on a diet are dismissed when you see very large bowls of Greek yoghurt containing at least 10 per cent fat content every morning for breakfast. Usually the yoghurt is so thick and creamy that you need some serious muscle power to shake just a dollop into your own bowl. Greek yoghurt is apparently good for the digestion particularly after consuming rich meat or fried foods. Often served as a dessert with preserved fruit or whipped together with cream, good Greek yoghurt is one of those universal substances that seems to appear at every meal. Z is for Zucchini. Whether it be deep-fried zucchini balls (kolokythokeftedes), pan-fried slices of zucchini or stuffed zucchini, the Greeks know how it make this vegetable taste just that little bit better. And so now I have come to the end of my own culinary odyssey and time in Greece. 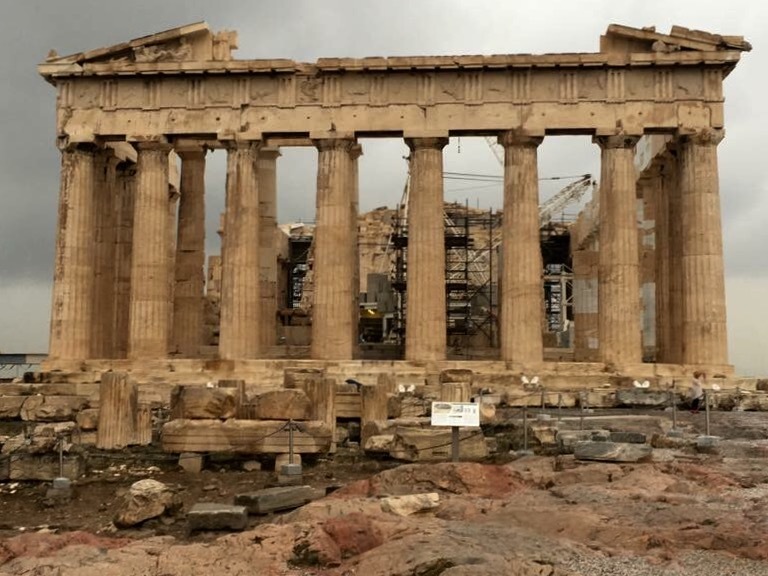 Although I’m looking forward to going home and practising some of the recipes I learnt at a cooking class in Athens, a recent visit to the historic site of Olympia and hearing about the ancient gymnasium and athletic rituals has inspired me to start training for the 2020 games! This post is a parody or tongue-in-cheek version of Intrepid’s trip notes for the Real Food Adventure of Slovenia and Croatia, which is an exciting new addition to their unique culinary travel program in 2016. It is not intended to be a slur against, or criticism of, the Intrepid company or its tour leaders and is entirely reflective of my own experiences on this journey. I loved my tour and the friends and memories that I have made on this particular trip. I am grateful to Intrepid for hosting these culinary adventures and creating the framework which allowed me to explore and experience a part of the world that I thought I would never have the opportunity to see through my own eyes. That being said, there are trip notes … and there are trip notes. I thought I would compare and contrast my experiences against the current version of the trip notes available for the Real Food Adventure of Slovenia and Croatia. Intrepid: Welcome to Slovenia. Known as ‘Europe in Miniature’, tiny Slovenia has a huge heart and a wealth of diversity. 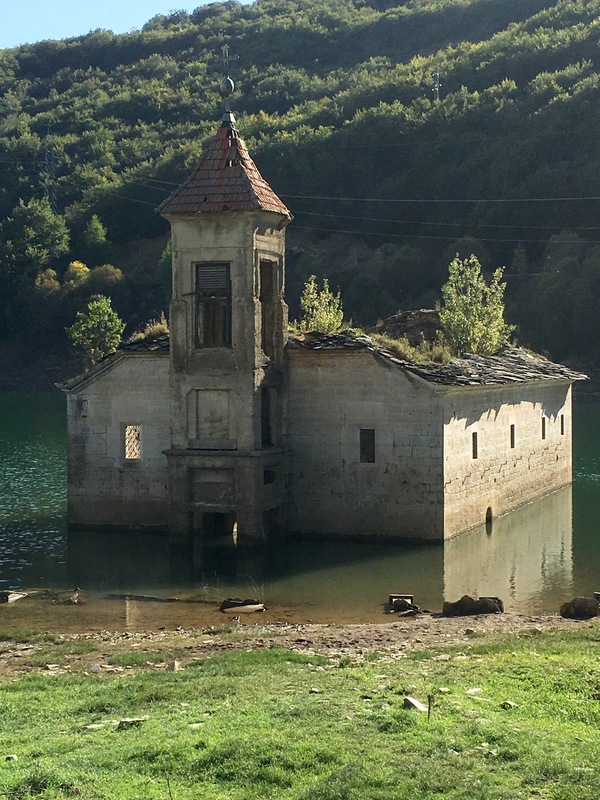 The soaring Julian Alps capture a touch of Switzerland, the radiating coastline oozes Mediterranean charm, and Bled’s island church appears to have come straight out of a fairytale. This small country is home to a surprisingly complex cuisine, divided into 23 culinary regions by local ethnologists. Best known for hearty, alpine stews, goulash and sauerkraut, Slovenia also boasts wonderful cakes and strudels, not to mention the culinary treasures found in the coastal Karst region, including teran wine, prsut (air-dried ham) and sensational olive oils. Your adventure begins with a welcome meeting tonight at 6pm. Picturesque Ljubljana is perfect for starting a food odyssey, with a surprisingly diverse food scene that belies its size – great local eateries, progressive modern restaurants, street food, cafes and cake shops. Toast to your trip with a glass of Slovenia’s national drink: schapps (snopec in Slovene). This fruit-based liqueur comes in a variety of flavour incarnations, although the local favourite is viljamoka, flavoured with Williams pear. Your leader will suggest a great eatery in the heart of the city to sample some delicious traditional dishes. My version: A day to explore the beautiful city of Ljubljana on your own before meeting your tour leader and fellow travellers at the 6pm. Although Slovenia is a country that boasts 24 gastronomic regions and nearly 190 characteristic, recognisable local and regional dishes, you will need access to the hotel’s wifi capability to ensure that you familiarise yourself with these specialties during your own free time. Take advantage of the opportunity to visit the Ljubljana Castle and discover for yourself why the name Ljubljana means “beloved”. Enjoy a delicious goulash matched with a red wine from the region (self-selected and at your own expense) in a nearby local cafe. Intrepid: Get to know this fairy tale city on a breakfast food tour. 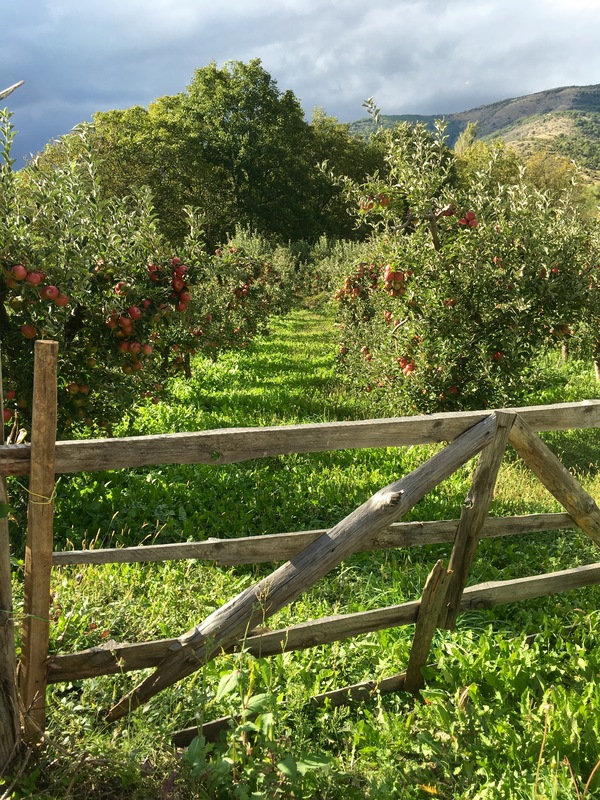 Savour delicious pastries, cheeses and charcuterie, and in the Central Market discover the importance of apples and especially honey – there are more than 9,000 beekeepers in Slovenia! Along the way, learn a little of the city’s history and culture. Stop at the city centre Prešeren Square, dedicated to the Slovenian romantic poet, France Prešeren. With views of the Triple Bridge and Ljubljana Castle on one side, and a magnificent Franciscan church on the other, you’ll feel like you’ve just walked right into a scene from a beautiful postcard. In the afternoon, take a public bus to Bled (approximately 1 hour). Situated on stunning Lake Bled at the edge of the Julian Alps, there are many outdoor activities to get the blood pumping in Bled: rafting, caving, canoeing, and swimming, to name a few. But you’ve come for one reason – a delicious cream cake called kremna rezina (kremsnita to the locals). It’s thought to have been invented in the kitchens of Hotel Park in 1953 by Ištvan Lukačevič, chef of the hotel’s confectionery store. Since its invention, more than 10 million kremsnita have been baked at the hotel’s patisserie. Tuck in to your own slice to find out what all the fuss is about. Return to Ljubljana by early evening. My version: Slovenia is a charcuterie connoisseur’s idea of heaven – abundant offerings of cured meats, salami, cheese – all available from the hotel’s breakfast room. After breakfast, your tour leader will take you on a stroll through the city centre where you have the opportunity to learn a little more about the city and its more familiar sites, including Preseren Square and the stunning Triple Bridge. You have no less than 30 minutes at the Central Market to wander around the stalls and purchase local fresh produce. 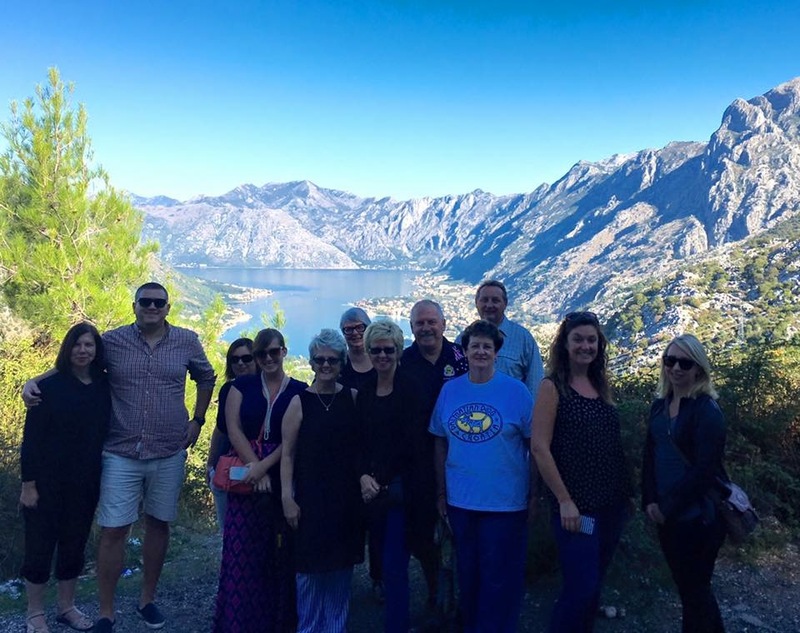 Your induction tour ends at a popular eatery that specialises in Slovenian food – try pumpkin seed oil, goats cheese flavoured with tarragon, chilli or pepper, pate, pork crackle and a smear of pork fat – enjoyed with a glass of Slovenian wine. In the afternoon, get acquainted with the locals and enjoy a public bus trip to the town of Bled in the north of Slovenia to try the fabled dessert, kremsnita. With a couple of hours free time available to explore, why not climb the hill to visit Bled Castle with its stunning views of the lake below or for a mere 4EUR, jump on the touristic mini train and feel the wind rush through your hair as the conductor races around the lake at breakneck speed and skips all the scheduled stops. 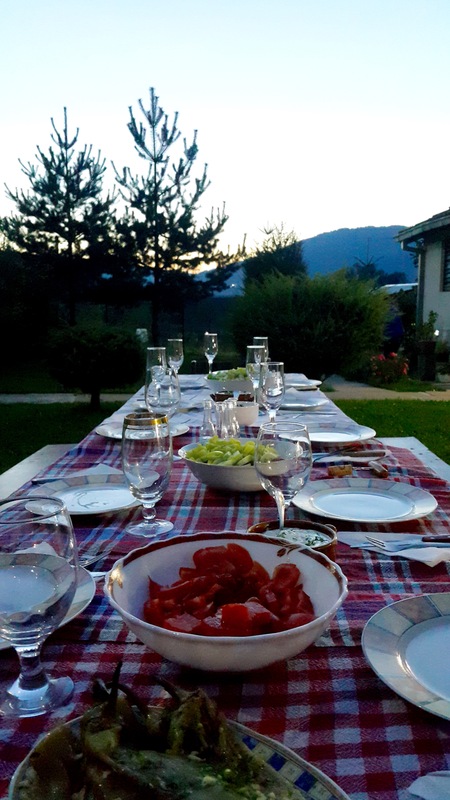 As the sun sets, take a short bus ride to the village of Lesce for dinner at the renown “Sova” restaurant to indulge in its eclectic cuisine which is a marriage of both new and old. Return to Ljubljana by train, just in time to pack your bags for the next day’s early start.